Often compared to other top European lotteries, Eurojackpot has become one of the fastest growing lotteries in Europe. Eurojackpot may not reach record breaking jackpot, but does payout more frequent than lotteries since the game’s release in 2012 in 14 countries throughout Europe. Croatia, Denmark, Estonia, Finland, Germany, Iceland, Italy, Latvia, Lithuania, the Netherlands, Norway, Slovenia, Spain and Sweden. Compared to other lotteries like the EuroMillions and the German Lotto 6 aus 49, the EuroJackpot is designed to pay out much more frequently (1:59 million odds versus 1:117 million for the EuroMillions and over 1:139 million for the German Lotto). As a result, it is not anticipated that the lottery will grow to the same record-breaking sizes achieved by the EuroMillions, as it will most likely be won instead. The record for the largest jackpot for the EuroJackpot was set on April 12, 2013 where a single prize-winner from Germany won the 46.079.338,80 Euro jackpot. Up to January 31, 2013 the EuroJackpot lottery had a ‘rolldown’ clause: in case the jackpot is not won for 12 consecutive draws, the 13th draw will be subject to a rolldown whereby if no winner is able to match all 7 winning numbers, the jackpot is paid out to the next winning tier where a winner is available. 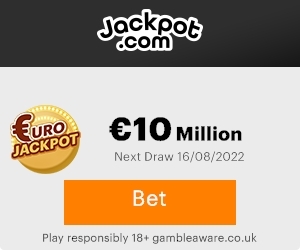 It was this clause that set the previous jackpot record of 27,545,858.00 Euros in August 2012, as a German player who correctly matched the 5 main numbers, but only one of the Euronumbers (out of two), walked away with the jackpot in the second prize tier. v ou can play online at Lottoland.com. You can also purchase paper tickets at selected locations in participating countries. The cost of playing is €2 per ticket. There is an additional non-recurring administration fee of €0.50 per ticket. The EuroJackpot lottery was proposed a few years ago, in 2006, to compete with the EuroMillions lottery. By virtue of a large number of participating countries, the EuroMillions is able to offer considerably larger jackpots than those offered in a single national lottery. After seeing the success of EuroMillions, Germany, Finland, Denmark, Slovenia, Italy and the Netherlands met in Amsterdam in November 2011 to complete the negotiations for the EuroJackpot lottery and to begin the roll out in 2012. After the negotiations, Estonia also decided to participate in the lottery. Spain joined the EuroJackpot from 30 June 2012 with the ticket concession granted to ONCE, the National Organization of Spanish blind people. On February 1, 2013 Croatia, Iceland, Latvia, Lithuania, Norway and Sweden affiliated the EuroJackpot lottery. The first ticket sales began on March 17, 2012 while the first ever draw took place on March 23, 2012 in Helsinki. Last Friday, the international lottery, EuroJackpot, was cracked for the third time since March 2012 with the winning numbers 9, 20, 21, 33 and 49 and the Euro Numbers 5 and 7. A single player from Bavaria chose the correct combination of numbers last week and won the first prize category: €11 Million. According to Lotto Bavaria, the owner of the winning ticket is yet to be identified. The prize has so far not been claimed and the winner has therefore not been named. In order to win the first prize category, 5 numbers and 2 additional Euro Numbers must be chosen in the correct order. Last Friday this incredible feat was achieved but it remains to be seen, whether or not this €11 Million prize will be redeemed by the rightful winner. For the first time in EuroJackpot’s short history, the first prize, this time nearly €20 Million, was successfully cracked on 11 May 2012. The first big win of €19.5 Million goes to Germany! To be more precise, it happened in the Ruhr area, between Gelsenkirchen and Recklinghausen. It was there that a lucky player finally bet on the all of the correct Euro Jackpot winning numbers. On the 11 May 2012, that player became a champion. The magic EuroJackpot winning numbers 15, 21, 38, 39 and 47 with Euro Numbers 1 and 5 were finally all arranged on one winning EuroJackpot lottery ticket. The identity of the player who became a millionaire overnight remains unknown. But as the Munster based operating company Westlotto predicts, the player from North Rhine-Westphalia will not hesitate to come forward and claim his or her sizable prize for much longer. We congratulate the freshly hatched multimillionaire and are thrilled that are first Jackpot in EuroJackpot history goes to a player from Germany! For the next Euro Jackpot drawing on 18 May 2012 there will once again be €10 Million back in the pool. The drawing of the winning numbers takes place every Friday evening at 21:00 CET in Finland and a deadline of 19:00 at your lottery retailer. The draw may be broadcast on a local television station where you live, or you may watch a video of the draw here. The results are confirmed on the same night as they are announced at which point winnings can be redeemed. However winning tickets are evaluated in the countries of Denmark and Germany before prizes are awarded to the winner and payout is already starting Saturday morning, upon presentation of your ticket receipt at your EuroJackpot lottery retailer.